I don’t know exactly why but there is an awful lot of confusion about when specific episodes of Irwin Allen’s Swiss Family Robinson originally aired on ABC during the 1975-1976 season. Television Drama Programming: A Comprehensive Chronicle: 1975-1980 by Larry James Giankos lists airdates and titles for 19 episodes but TV Guide and television listings in a variety of newspapers indicate there were actually 20 episodes. Most online sources agree that there were 20 episodes. Television Drama Programming states that the series premiered on Sunday, September 14th, 1975 but did not air the following week, returning with its second episode on Sunday, September 28th, 1975. All evidence I have found states this is incorrect. An episode of Irwin Allen’s Swiss Family Robinson (“Man o’ War”) did indeed air on Sunday, September 21st, 1975. All of the episode titles listed in Television Drama Programming match titles given in newspaper listings but some of the dates are wrong. A number of online sources also have titles and dates that conflict with TV Guide and newspaper listings. Furthermore, although some online sources state that the two-hour pilot telefilm was repeated on Sunday, September 7th, 1975–which would have been the week before the series premiered–I can find no evidence that it did. It’s possible it was only seen in parts of the country due to a live football game that started at 9PM ET. Finally, Television Drama Programming and some online sources contend that the Sunday, December 14th, 1975 episode (“Ernie’s Christmas”) was a two-hour special but listings in numerous newspapers confirm that it was a regular one-hour episode that aired from 7-8PM followed by The Six Million Dollar Man at 8PM and The ABC Sunday Night Movie (What Ever Happened to Aunt Alice?) at 9PM. 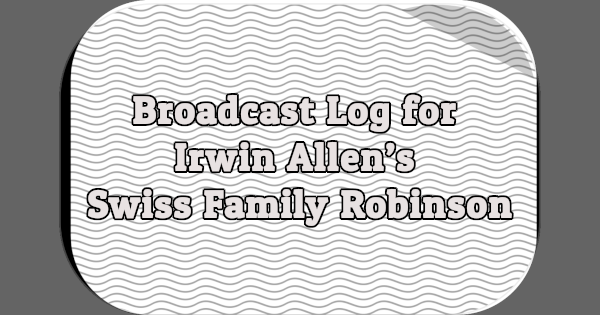 What follows is, I believe, an accurate list of Irwin Allen’s Swiss Family Robinson episodes: original broadcasts, repeats, and pre-emptions. However, I want to stress that TV Guide and newspaper television listings are not infallible and it is entirely possible that ABC decided to pre-empt certain episodes and air them later in the season, making printed sources inaccurate. My article on Irwin Allen’s Swiss Family Robinson can be found here. If you have any corrections or questions, please contact me or hit the comments. I noticed this when I saw Feb. 29, 1975 here. These all should be 1976. They were all Sundays in 1976. The only time this show aired on a night other than Sunday was when the pilot movie aired. Apr. 15, 1975 was Tuesday. I have no memory of ever seeing this movie or show, since as a child I was much more into sitcoms than dramas. I think back at this time the networks would rather air original programming, like the pilot movie, in April than May, even though May was a Sweeps month, since the official network seasons ended in April, and a network could claim victory for a season in April. CBS & NBC did this to each other a few times in the late 60s & early 70s.